At 14h20 on the 7th December 2009, Shosholoza Meyl economy class Train No 17007 going from Cape Town to Johannesburg collided head on with the Shosholoza Meyl tourist class Train No 71010 going from Johannesburg to Cape Town (it is understood one of the trains was stationary); along the Carletonville road in Boskop, about 25km north of Potchefstroom. Police suspect that one failed to switch tracks. Whilst the locomotives did not overturn, several carriages did. (Earlier reports incorrectly said that one of the trains was the luxury Premier Classe train). A 24-year-old pregnant female passenger (initially incorrectly identified as the train manager) had multiple facial injuries and paramedics could not revive her (she was on the economy class train to Johannesburg). A hundred and 7 people (mostly toddlers & teenagers) were injured (4 critically, including a 3-month old baby) and taken to the Lesley Williams, the Potchefstroom Hospital and some as far as the Tshepong hospital outside Klerksdorp. Emergency services personnel were still on the scene just before 4pm. Lydia Ntsabelle from Swellendam bit her tongue and some of her husband Piet's teeth were knocked loose (they were returning home after visiting their kids in Johannesburg). There were 159 people in the tourist train and 494 passengers onboard the economy class train. Those not requiring hospitalisation spent hours waiting in the sun with their baggage for buses to pick them up and take them to Park Station in Johannesburg. The damage was estimated at R30-million. "This incident is unfortunate, and the RSR (Railway Safety Regulator) will ensure that the Passenger Rail Agency of SA … based on the outcomes of our investigation, puts in place measures that will ensure we do not have a recurrence of an accident of this nature." said RSR spokesman Lawrence Venkile. "I was very shaken to see people being carried off in stretchers, but it was touching to see how helpful South Africans are to each other," said Giselle Alexander, a passenger from Worcester. "The train shook terribly and then we just saw dust outside. Our carriage was just before the dining room carriage. There was broken glass and cutlery everywhere." said Janet Fouché from Orange Grove in Johannesburg. 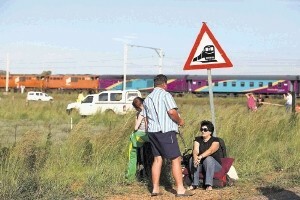 The last serious accident involving a Shosholoza Meyl train was on the 27th October 2007, when a Shosholoza Meyl train crashed into a stationary Blue Train outside De Aar (no fatalities, but 5 people seriously injured).